2 decks. Average. 3 redeals. 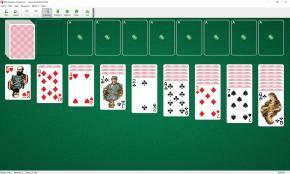 Harp Solitaire uses two decks (104 cards). You have 9 tableau piles with the number of cards per pile increasing from one to nine from left to right. The top card is face up. You have 8 foundations. The top cards of tableau piles and waste pile are available to play. You may build tableau piles down in sequence and alternating color. Only one card at a time can be moved from pile to pile, except when moving group of cards headed by a King into an empty tableau pile. If, during play, one of the closed cards becomes the top card of a stack, it turns over. Empty tableaus may be filled with a King or group of cards in proper sequence headed by a King. Harp Solitaire is one of the solitaire card games included into the BVS Solitaire Collection.